A couple weeks ago I posted about my "To belt or not to belt?" debate. 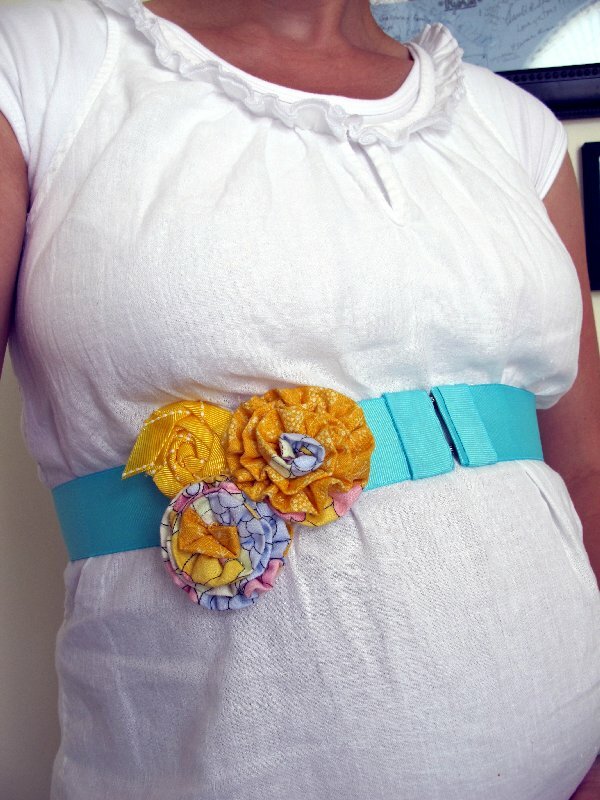 I was wondering whether it was considered "okay" fashion-wise to wear belts above a big pregnant belly. 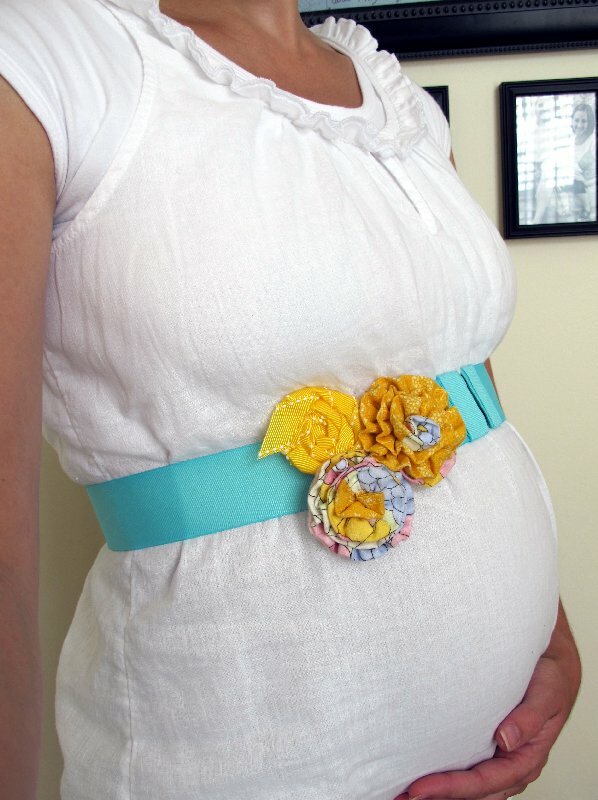 Well thanks to my friend Mary (who is always my go-to person when it comes to fashion advice), I have decided that YES, belts are a great accessory even for maternity outfits! I have a hard time with the way that maternity shirts and dresses seem to make your chest and your stomach morph into one big lump. It is not flattering. I have found that a belt adds a little shape to my all encompassing maternity clothes and lets the world know that, "Yes, I do still have a figure under there!" So, I bought this great little pink, flowery, ribbon belt at the Outlets the other weekend. It is so simple. It's just a ribbon, that ties in a bow in back, and is detailed with some cute little fabric flowers. I love it so much, so I decided to make another one for myself. 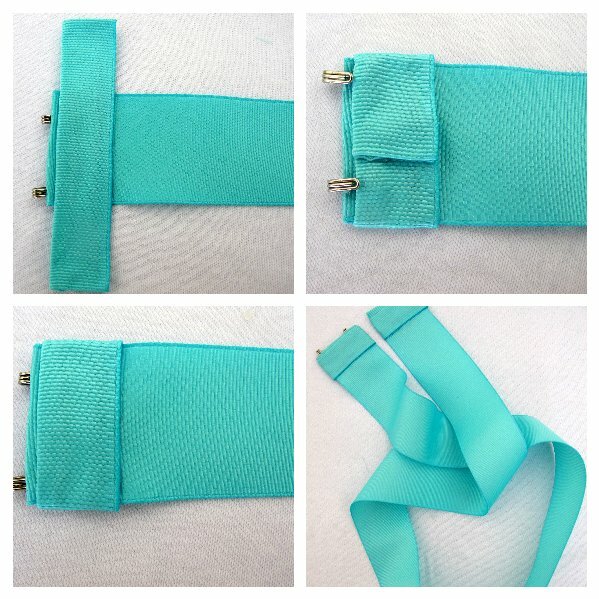 With this one, instead of just tying the ribbon, I decided to make a little hook and eye closure for something a little different (mostly because the ribbon was too thick to tie prettily - not a word I know!). Want to know how I did it? Well, here is a quick little tutorial however, it is painfully simple. Especially since I opted to use a hot glue gun for most of it instead of my sewing machine. 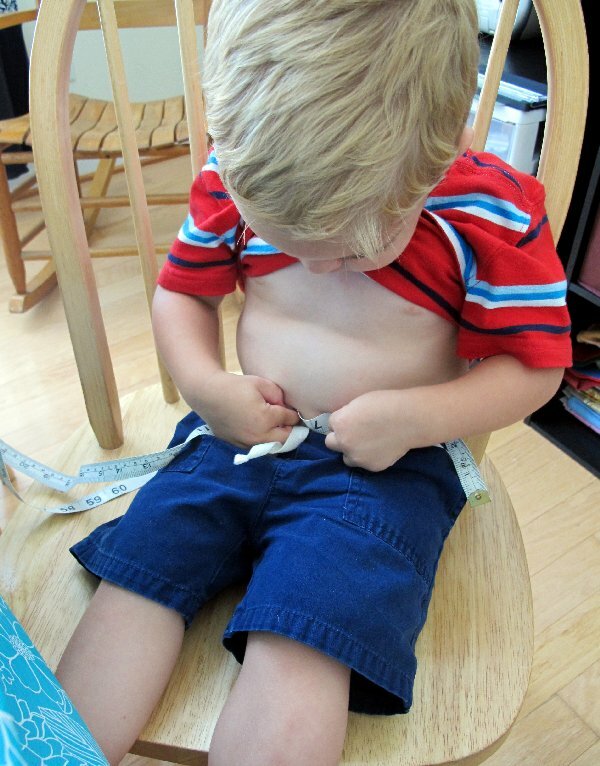 Then Ande decided that he better measure too. 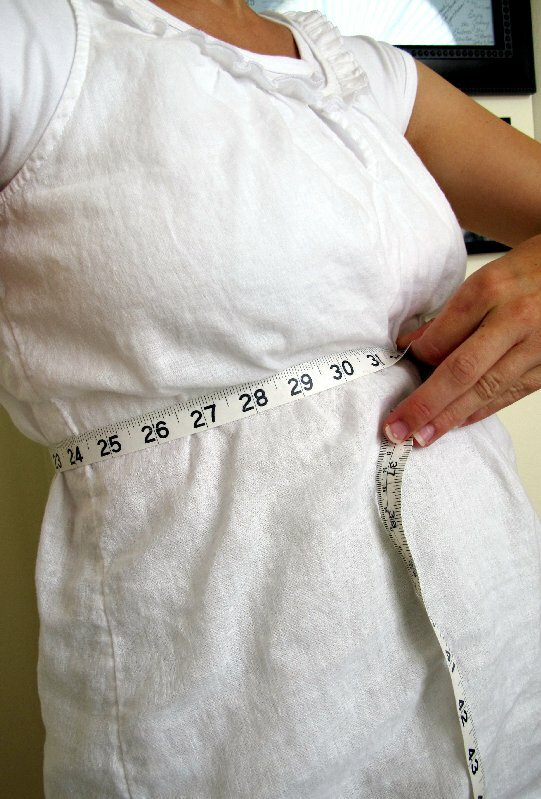 Next, I cut my ribbon about 1 1/2 inches longer than my waist (if you can call it that) measurement. Now for the fun part. I always get excited when I fire up that glue gun, even though I always end up burning myself. 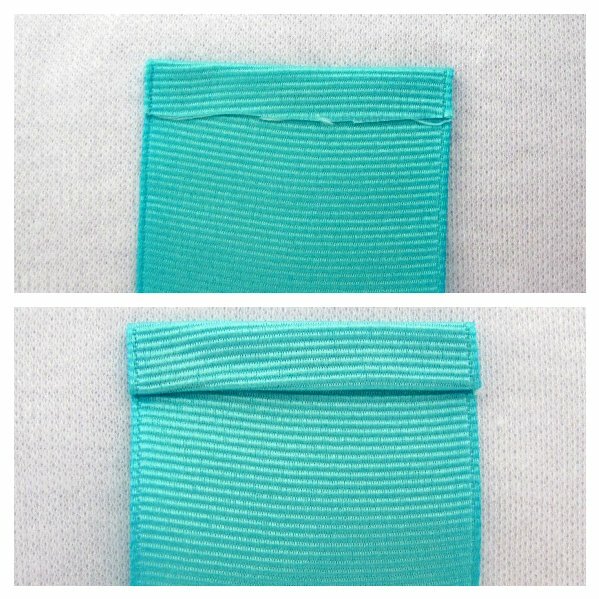 Flip over the edges of the ribbon 2 times and glue each time to hide the raw edges. Attach your hooks and eyes (or is it hook and eyes?). 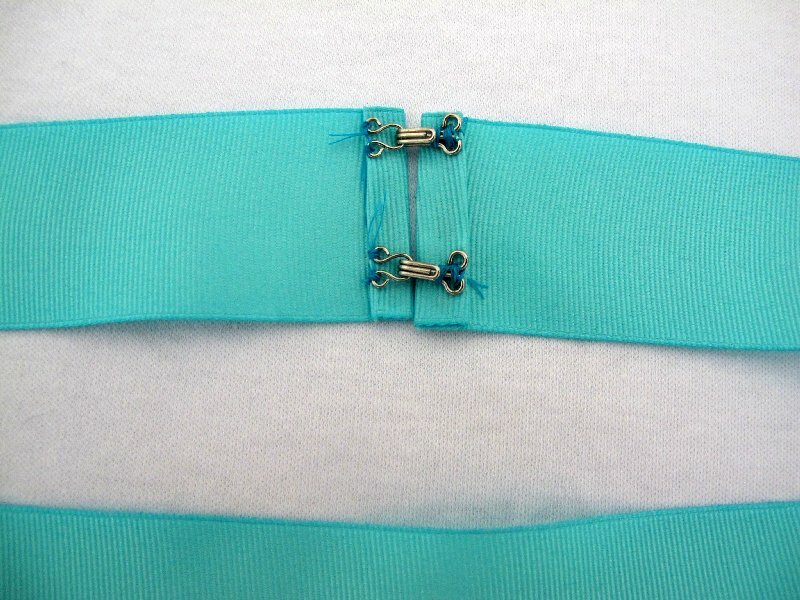 I didn't want to see all of the threads from sewing on the hooks and eyes so I decided to add an extra piece of ribbon to cover up each end. 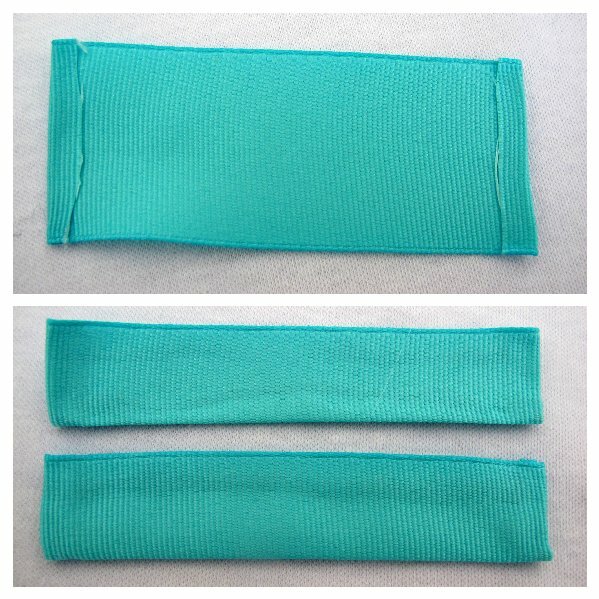 Cut a piece about 2 1/2 inches long. Fold over each short edge and glue down. Then, glue the piece in half the long way. 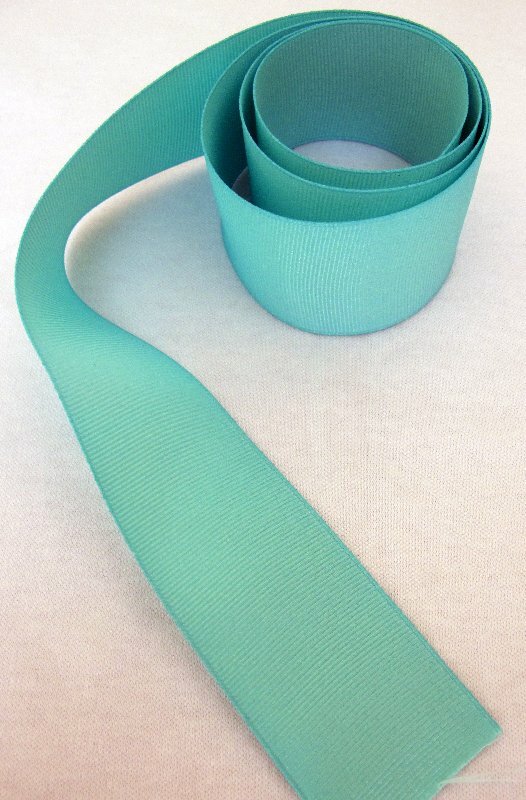 You should make one for each end of the belt. Glue around each end of the belt, overlapping on the inside. *All of this could be done by sewing instead of gluing. It probably would look much better and more professionally finished. I had some issues last time I tried to sew with ribbon so I opted for the glue. Make some little fabric flower embellishments, and you are done! This is for all you family members out there hoping to catch a glimpse of me. I am coming up on 29 weeks! I love how the belt gives me my waist back! I also love how my white shirt makes it look like I am somewhat tan (which I am definitely NOT). I am hoping to work on that this weekend! that belt is really cute, and you look amazing! I wouldn't have guessed you're already at 29 weeks. this is so cute! I love it! I enjoyed looking at your blog! 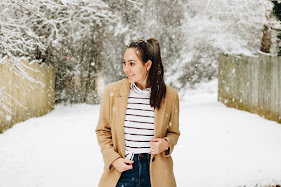 I am your newest follower and would love it if you would take a look at my blog and follow me too! Thanks! So cute Lindsay! I love it....something I'll have to try. I love the super cute preggo belly. You look great! That is so cute! Love the style and the colors! I am highlighting this at somedaycrafts.blogspot.com. Grab my "featured" button. I love it! I love the color of the ribbon and the flowers!! Great job:) I am your newest follower! Love this! 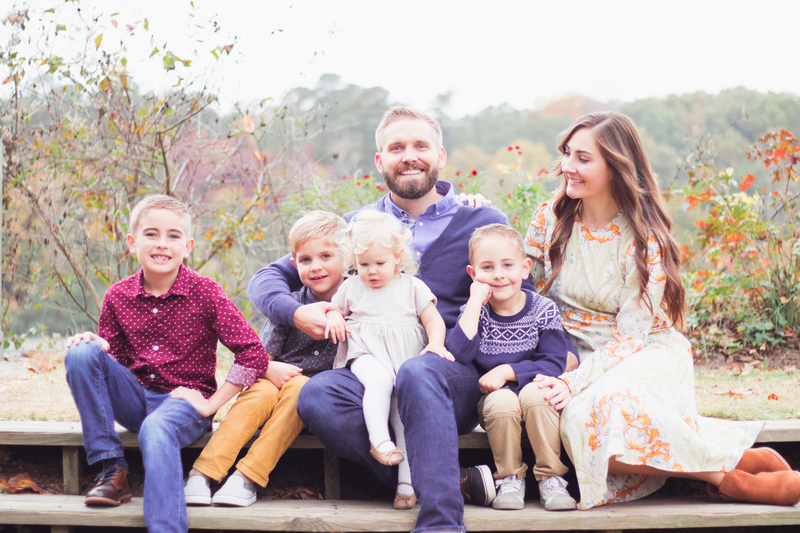 I actually live in SC - So I think we aren't too far away! I am always looking for crafty bloggers that live in the South East! So cute! Love how you finished the ends. I made a flower sash that ties for Easter but have been looking for other ideas (other than tying the ribbon). 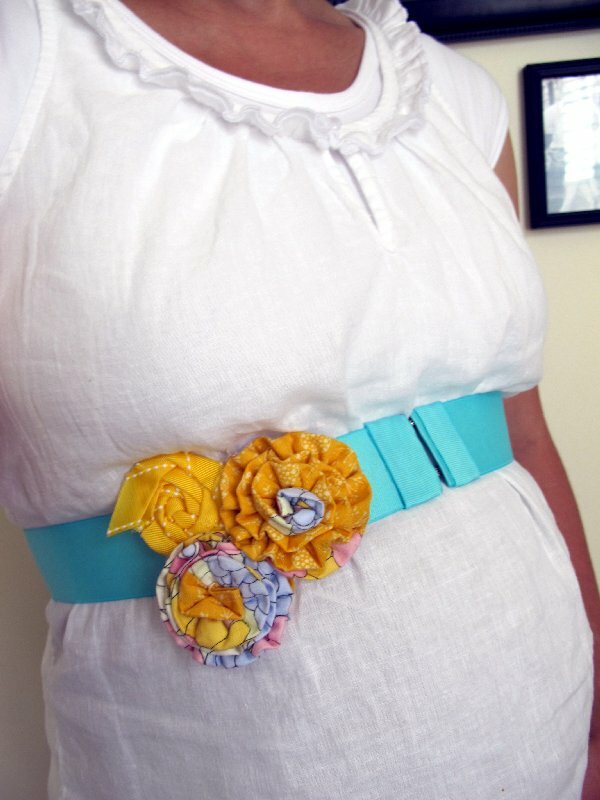 Cute belt. I love the bright pop of color. Maternity clothes are definitely cuter these days than when I got to wear them. Way to rock the preggo look! What a nice belt. I like it, and it looks so simple.